We’re spicing things up in the kitchen today with Herb Marinated Sirloin Steaks, but that’s not even the best part. We’ve prepared our steaks with the Sous-Vide, a French technique that will guarantee you a perfect dish every time! It wasn’t long after I turned my original blog into the site you’re visiting today that I watched the movie ‘Burnt,’ in which Bradly Cooper plays a veteran master chef looking to make a comeback after a long, self-imposed hiatus. Upon his return to cooking, he finds that the industry, and people’s taste, have changed, and ultimately a large part of the plot revolves around him adapting to those changes. In one scene, he scoffs at the idea of preparing vacuum sealed food, dismissing it as sci-fi nonsense in favor of his more traditional, and less-efficient, cooking methods. Later in the movie, the chef who originally suggested using the machine is proven right – that vacuum-sealing is a modern kitchen necessity – and thus, it becomes a staple in the kitchen of Cooper’s character. The more I work on Living the Gourmet, the more and more I relate to that movie. Naturally, that brings us to today’s recipe – Herb Marinated Sirloin Steaks. The night before the machine arrived, my daughter had prepared the steaks in FoodSaver Sous-Vide Vacuum Seal Bags using the FM2000 Vacuum Sealing System with a marinade – this would not only seal the steaks in with the flavors of the marinade, but it would also allow the steaks we didn’t use to remain fresh up to around five times longer. In other words, prepping ahead just became wildly easier, and more efficient. On a side note, pretty much anything can be stored away in these vacuum sealed bags – think veggies, salmon fillets, chicken cutlets, pretty much anything you want to store for later. The marinade for today’s steaks used a base of olive oil and balsamic vinegar, with about six cloves of garlic (or roughly a whole medium head), dried oregano, fennel seeds, peppercorns, a generous helping of sea salt, some red pepper flakes, bay leaves, and a sprig of fresh rosemary. Once that was securely in the bag with the steak, she sealed it using the FM2000, and then she set them in the fridge to marinate overnight. 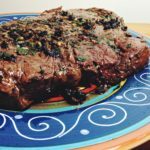 Now, again, we could have left these steaks in the fridge or freezer for around five-times the normal storage time, letting them marinade all the while thanks to the bags. Now, the way the sous-vide machine works is pretty simple, you just set the machine upright in a pot of water as pictured, set the vacuum sealed steaks in the water, and let them ‘cook’ for about an hour. 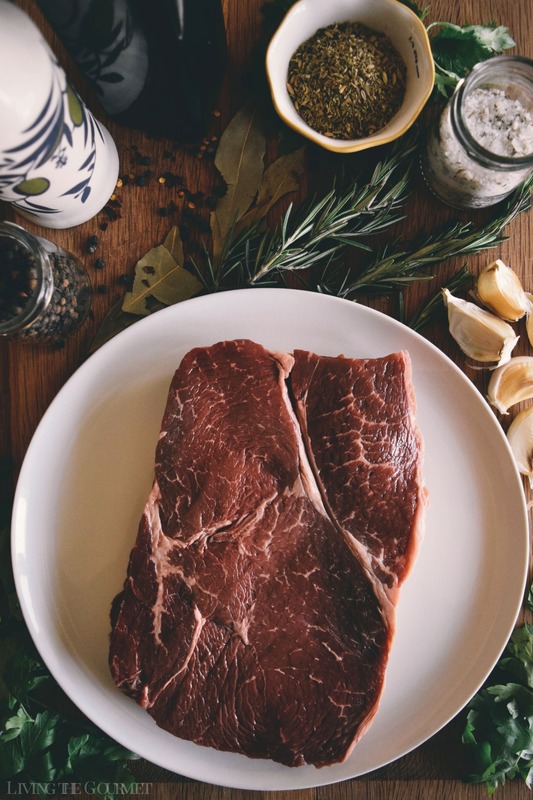 If you’re taking the steaks out of the freezer, no defrosting is required since the bags are durable enough to go straight into the hot water bath – yes, these are also microwave safe if you are so inclined. On the subject of durability…these bags are quite tough, well able to resist punctures and tears, so no need to worry about the ‘rigors’ of the prolonged storage for which they are designed. After about an hour in the sous-vide, simply take the steaks out of the bags, grill them briefly on the griddle to achieve a nice char, and you’re good to go, and just like that you’ll have yourself some delicious steaks. With things like veggies or salmon steaks etc., you can cook those fully using the sous-vide. Combine all ingredients for the marinade except for the rosemary sprigs, in a bowl and whisk to combine. 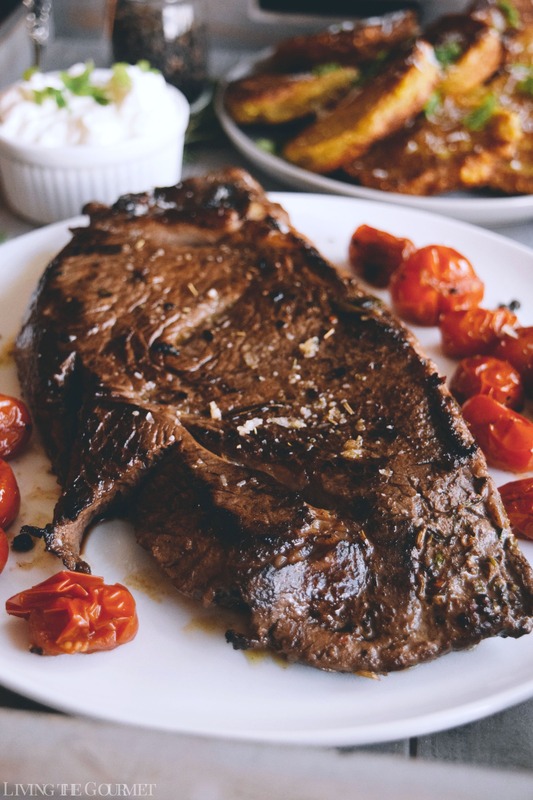 Place each steak in its own Food Saver bag and divide the marinade between each steak. 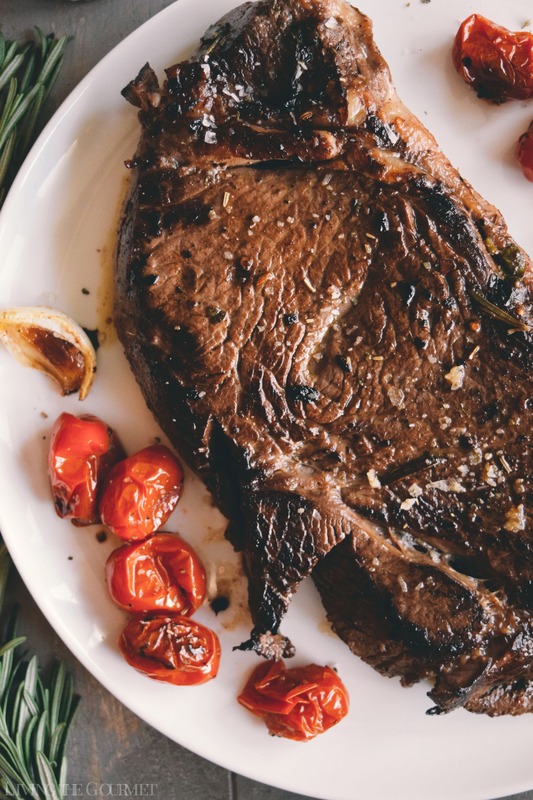 Place a rosemary sprig on each steak. 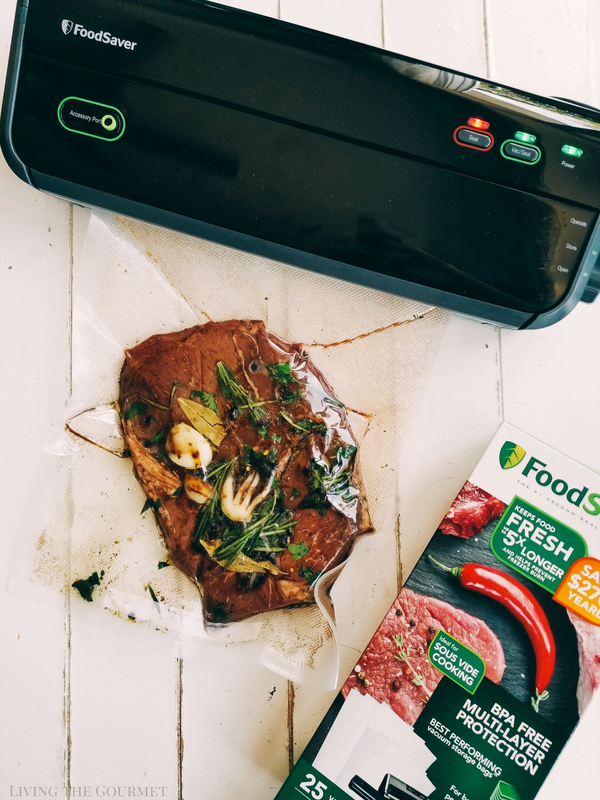 Follow the directions of your Food Saver to vacuum seal the steaks. Store in the fridge to marinade or in the freezer for a ready-to-cook meal. 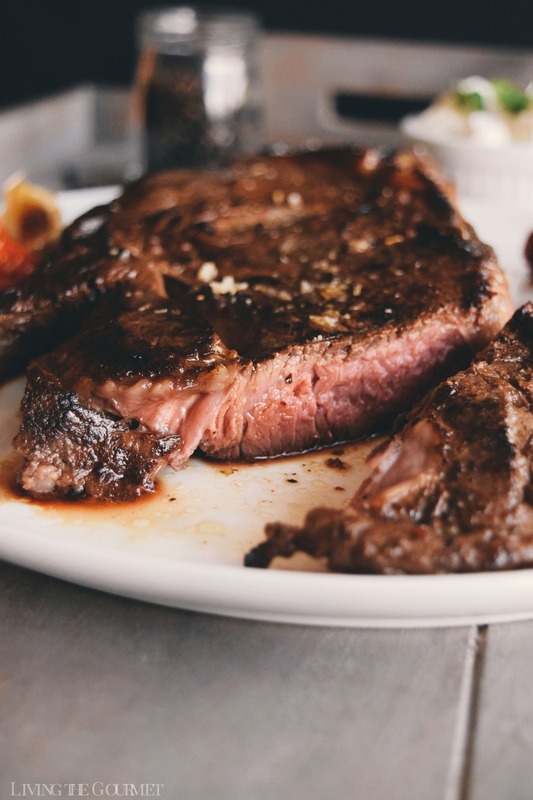 When you are ready to cook the steaks, follow the directions of your sous-vide for a flavorful, fresh Sirloin steak. It was a perfect summer meal paired with some plantain cakes and blistered tomatoes with shallots and garlic, but more on that in a later post. As for today, this self-styled gourmet had both learned the value of this particular kitchen appliance, while also learning a new cooking technique, and just like Cooper in Burnt, I’m thoroughly convinced. 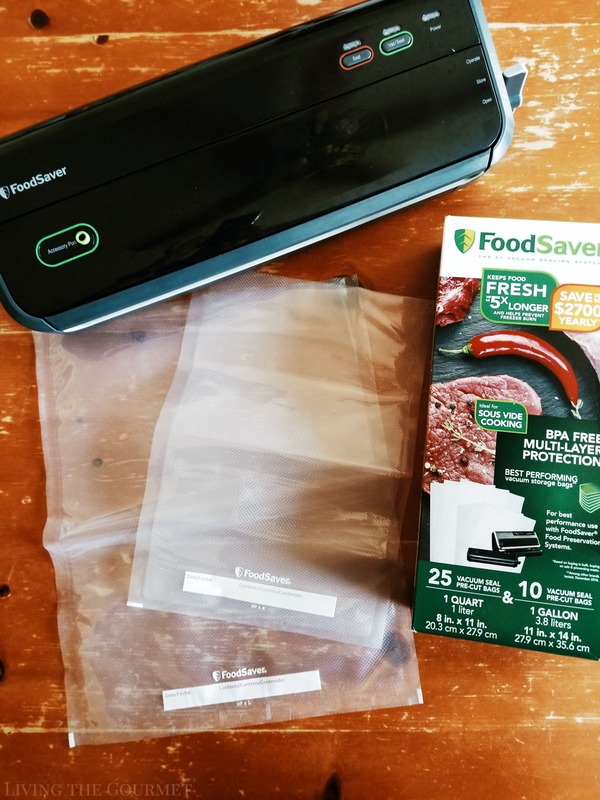 Remember, you can purchase FoodSaver Sous-Vide Vacuum Seal Bags, as well as the FM2000 Vacuum Sealing System in-store or online at Target, and during the month of July you’ll get 20% off on both products. So, what are you waiting for? This looks absolutely delicious !! hugs !! My mouth is watering terribly :-) What a fine gourmet meal! Have a wonderful weekend! Those steaks do look and sound delicious. 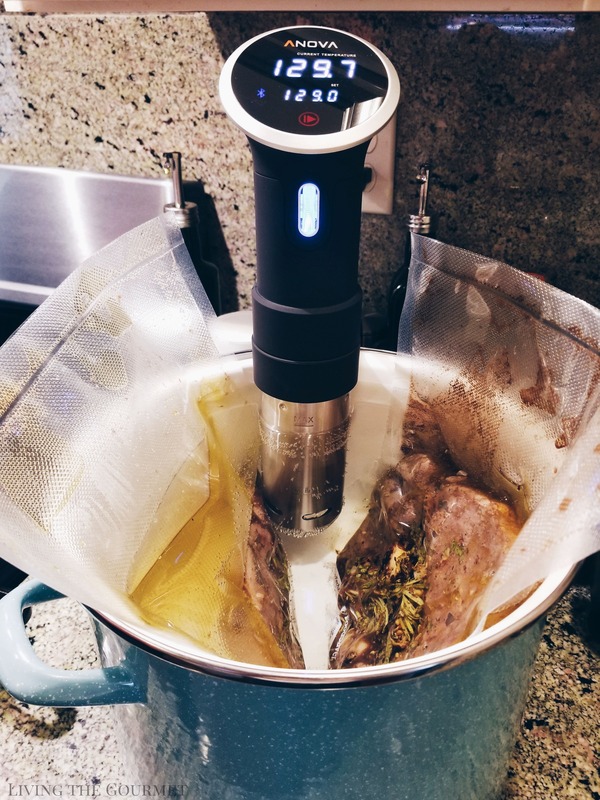 I can relate to the sous vide skepticism but for me it's an issue of the extra time it takes to use not whether or not it works. 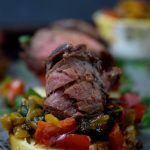 I have seen this technique on Masterchef but around here I am not sure if it is popular or not as I haven't seen one of these!The marinade sounds like something I want to try out. This steak looks downright amazing! I'm going to have to give this technique a try myself sometime! 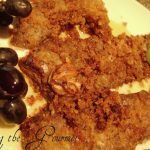 I've had others make meats like this and it's always so good! Now that looks like one juicy beautiful steak. 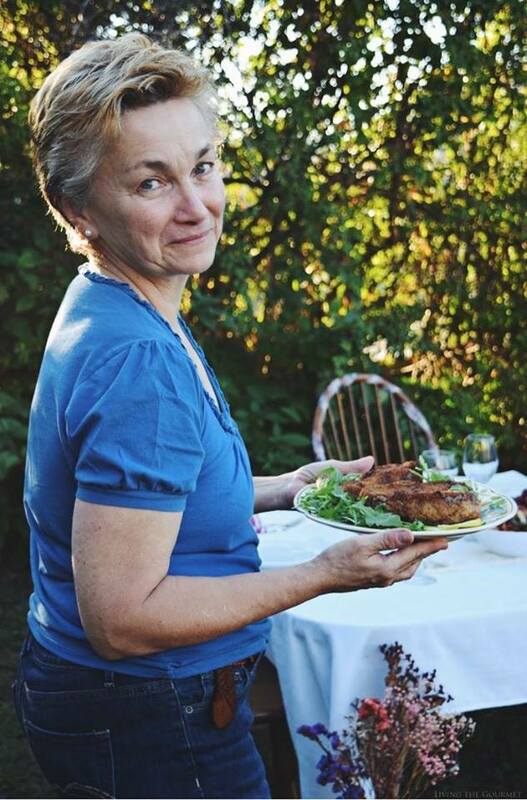 Love the herb marinade you have going here. Don't have a food save seal bags but I love the technique. Need to look for these here. 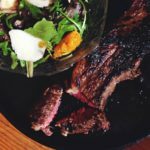 That steak looks delicious and juicy and marinade is perfect and simple I think next time when I do cook out I need tot try this one. This steak looks stunning! 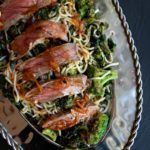 I've been thinking about getting a sous vide, and this recipe has me convinced I should definitely get one! Gorgeous presentation! The steak is so flavorful and juicy i can feel it from the screen! Your steaks are cooked to perfection! I have a Foodsavet, but think it would be awesome to have a sous vide! You and Tammy make a great team in the kitchen!!! A perfectly cooked steak!! I definitely want to give sous vide a try! What a fun way to cook steak...wish I could come over for dinner :-). 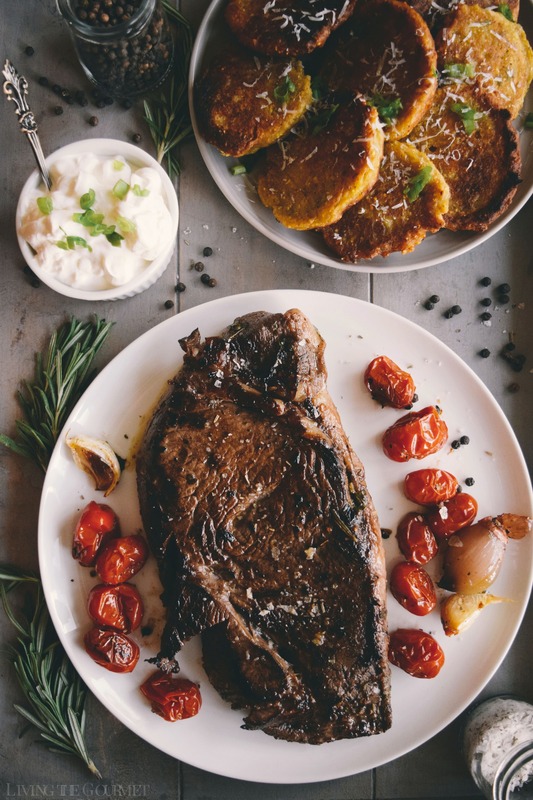 These photos have me dreaming of steak made in such a delicious way! It looks like it was cooked just perfectly.